This week every spare second has been spent in the studio culling through everything in there, getting rid of what I absolutely do not love, and trying to figure out a new system of organization for some of my supplies. All this is being done in preparation for the last new piece of studio furniture to be brought in. Hopefully I can get the rest of the supplies needed to finish it this weekend. I sort of ran out of steam and needed a little inspiration so I headed over to Pinterest to see if I could find something that sparked some ideas. This wall is just visually delicious to me and can you even imagine all the supplies those babies would hold? I could just imagine artwork displayed on these, love this idea!!! This would be great for traveling back and forth to the farm. I found myself in a little suitcase love! Suitcase dreams aside, I will dream my little space into the creative haven I desire it to be. Oh, but it is so fun to image and dream! I must put hands and feet to my dream and hopefully I will have a big reveal to show you next week! Do you have any savvy supply storage ideas? I'd love to hear your favorite! Gee a wall like that would be wonderful, I can only dream. 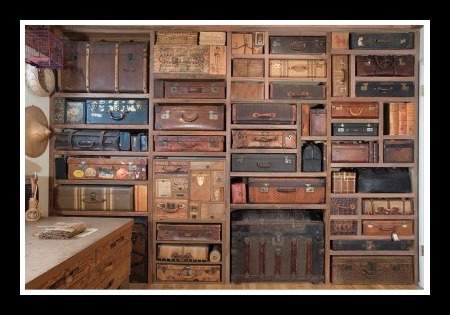 Love all the suitcase photos. I laughed reading your blog today! We're on the same wavelength...if you have time, pop on over to my blog and you'll see what I mean. I came across an old suitcase at our recycling center. 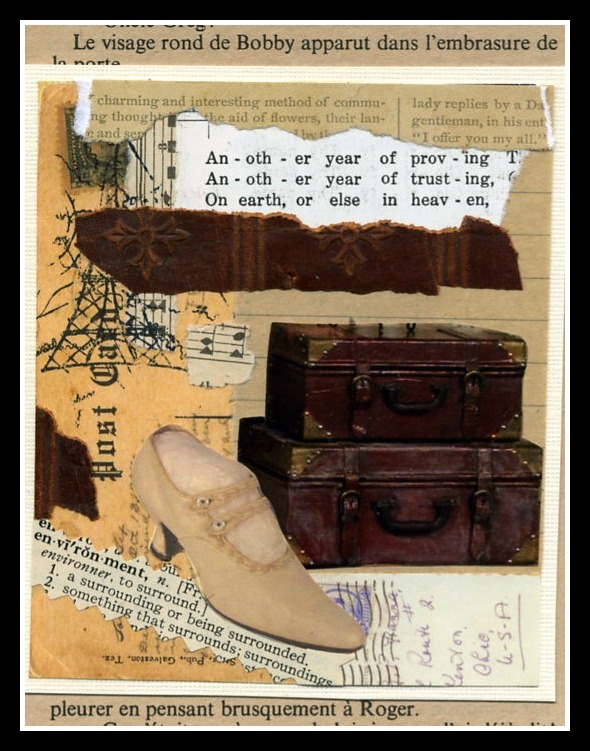 I'm not sure what it originally housed, but I'm making it into a traveling art suitcase.......love all your images! I'm with you girlfriend!! 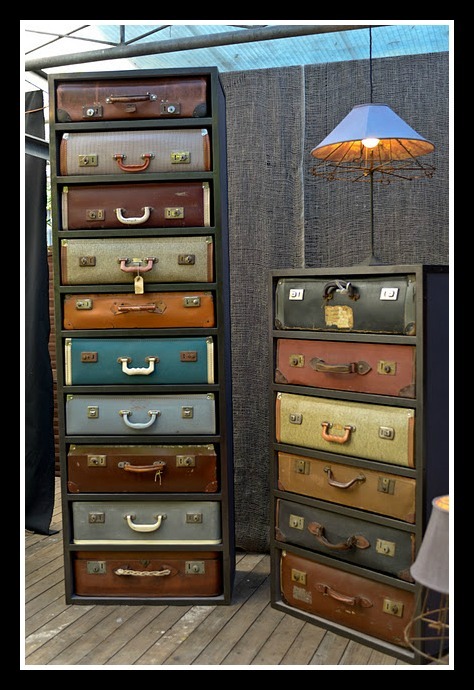 Old Suitcases are just plain cool!!!! And holy cow...isn't Pinterest just insane??? I mean inspiration galore!!!! Glad you found some!! Have a wonderful weekend! Those Pinterest ideas are wonderful, except for the chair...not a fan of that one. 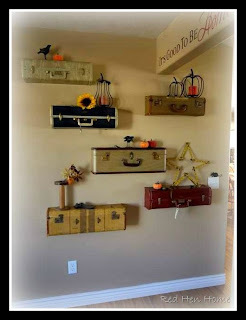 I especially like the wall of suitcases and oh the tags that you'd have to make. Personally, I think everything you have would get lost in there for a very long time. Looking forward to the big reveal. I'm very curious about what you're doing. 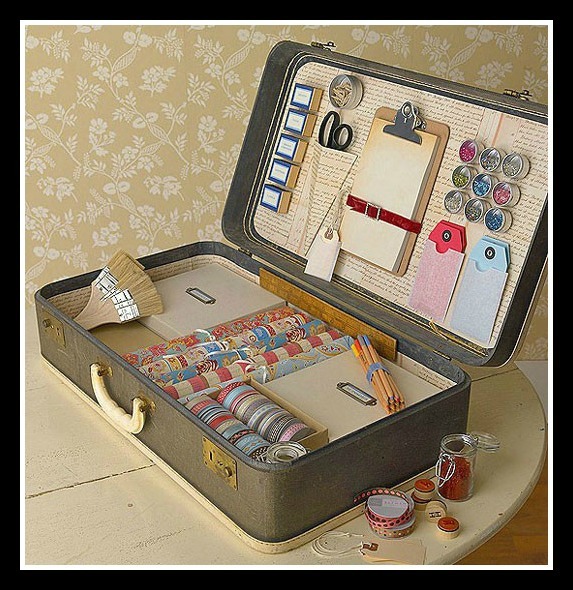 Maybe I should make me a wonderful collage, like you did, with some more suitcases on, to just have some more. I adore the suitcase wall, I have that issue of where women create, and just drooled all over it, lol. I also love the suitcase shelves and the shelves full of suitcases! So much vintage goodness I can't stand it. I wish I had more natural light in my studio but for now I'm just ecstatic that I actually have one! lol. Thanks for the inspiration! Hugs! 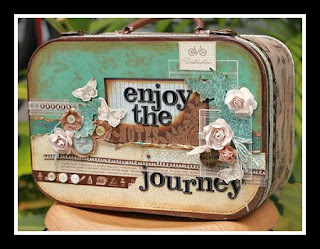 I'm having suitcase love with all these wonderful images! I really adore the suitcase chair. 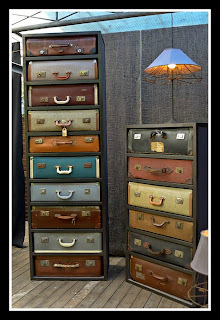 All that tufted goodness in a wonderful vintage suitcase. I'm not sure I would want to sit in it. I would just stare at it all day. I can't wait to see your finished studio. I've been doing the same thing with my supplies. I don't have a studio space only a cabinet of goodies. Have a fun weekend creating . . . I love old vintage suitcases! We've made several suitcase tables for our sons and to sell in a craft mall that I was a part of. I still have my Uncle's suitcase that traveled with him through all the states, even Hawaii. It's a treasure to me. I love the ideas you can find on Pinterest... such fab photos on there. I noticed your darling little doxie, Sophie, on your prev post. We have 2, a mother & daughter that we adore. Gur & Zoe. Zoe is a tiny miniature compared to her mom, so cute. Sophie looks like a sweetie!! Sandy, isn't that wall of suitcases amazing!!!! Imagine having the room for it, AND the collection to use! 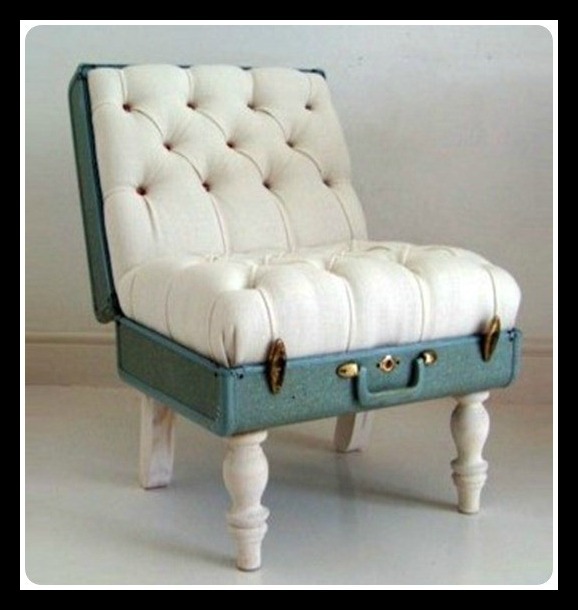 I am crazy about the suitcase chair from pinterest. I love your Blog. Karen does such nice designs. She did mine about 11 months ago. Suitcases are fun, whenever I visit the thirft shop, I check out what they have. My deal is must love the outside..but I inside must smell OK. I am now a follower. Ms Sandy I can't wait to see your reveal as I KNOW it will be divine. I too have suitcase envy. I will even tell you a seceret... I bought the most amazing 3 piece set from a shop called Vingettes (in San Dieo, CA). I had them shipped out & they arrived on Friday. I can't decide what to do with them. I'll try to photograph them & share soon! I miss all my blogging buddies & I'm trying to get back into the swing after the holidays & just haven't visited as much as I would have liked. I hope you will come by for a visit. HUGS! LOVE the old suitcases, so beautiful! I too have too many. Just wanted to pop in and say thank you for listing me on your sidebar, I am getting tons of visitors to my blog. I really appreciate it so much. Have a fab holiday weekend.